We go up Liberty Street (this choice perhaps deliberate, something America would totally do) to Greenwich, through sluices of concrete blocks to slow movement, to where a surprisingly small number of people point cameras at the construction. The entrance to the 9/11 memorial is laid out to process large crowds, but it’s cold and just after the holidays, and once we present our passes we’re directed past a nearly block-long zig and zag of ropes instead of through it. Everyone and everything tells us to KEEP PASSES OUT, which we do, and they are repeatedly checked. We follow the arrows down a tunnel made from white concrete barricades topped with blue-netted fence to a glass building. A young guard dual wielding hand-held lasers scans our passes. The building turns out to be an airport-style security checkpoint, so we squish our hats and puffy coats into the bins on top of our cameras and phones. We don’t have to remove our shoes, which is good because mine happen to be complicated. The detectors don’t find us or our stuff suspicious (no one really seems to be watching that closely anyway), and we spend an equal amount of time on the other side gearing back up. 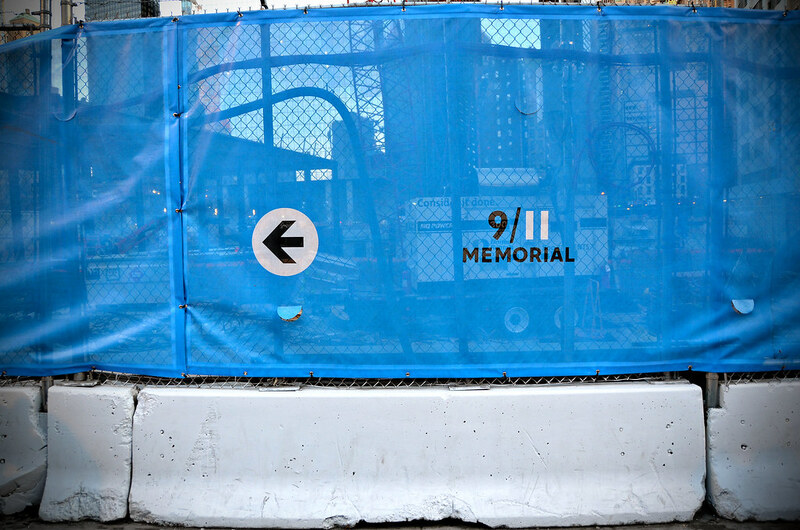 To exit we must show our passes, which we do, and then we follow more barricades and arrows pointing and making the path up to Ground Zero, this time right along the West Side Highway with New York in a hurry. A guard at the entrance to the memorial proper asks for our passes and, once satisfied that we belong there, waves us into the site. Most of the area is still a promise, an idea slowly unfolding. The museum, looking like a chipped box sinking on one end, isn’t open yet, and cupping our hands on the glass reveals a deep and broad space with a long way to go. The new swamp oaks stand in place, but they have given up for the season. We all take pictures — The Boy already has his mother’s eye — and the wind searches for our bones through our clothes. I loved to look straight up at a twin tower from its base, the way eyes work bending the top back toward me. You would swear they were built on a dare. But the new main building, now thankfully referred to simply as 1 World Trade Center, doesn’t have a precarious thing about it. Its heavy base leads the eye to compress it, to hold it down. Perhaps when I can stand close in the finished plaza I will see things differently. The waterfalls, however, are complete. I remember the fraught memorial design competition, and of the finalists, this one was not my choice. * I thought the emphasis on the tower footprints was too literal and heavy-handed, dwelling on the holes blown in lives and not the healing. Still, realized, they do make a powerful impression. Each is a sunk black box with water falling geometrically for about forty feet then pooling into a smaller square in the center. Lights run around the base edge of the pool, and the water coming down carries the light up into it, multiplying it in interesting ways. The names of the dead, so many names, have been cut into the black metal that frames the waterfalls. I pull out my phone and use the memorial’s web app to look up my wife’s law-school roommate. We locate his name near a corner of the north waterfall, and as the evening comes on we can see it glow from below. I have read that the sound of the water was designed to muffle the city and to promote contemplation. But when I close my eyes, the evenness of the roar conjures up airliners in flight — cruising, though, not accelerating, not approaching on a violent angle. Still, I assume this was not intended. And contemplation does not bring comfort. Memorials can provide places to offload grief, but so much remains unfinished even now, ten years out from 9/11. My thoughts about the attacks, ruminated into neater shapes over the years, have begun to show their original ragged edges. The war in Afghanistan, becoming medieval in its duration and destruction, is somehow older than Q and The Boy. I remain mostly proud of my city, less so of my country that became a wildly flung fist. I don’t know what to do or to think about any of it. After only a little while, the cold wins, and we go back through the barricades and out into New York to eat. Always go back to the body. We order burgers and fries just a few blocks over at a place we’ve been wanting to try, and we crack peanuts from their shells while we wait for the food to arrive. Construction and change are everywhere; this neighborhood can’t become itself fast enough. Remember, but don’t let memories get in the way. Write down the names where they can be touched and traced. Yes, a pool, too, but a small one with its own shape. And leave the surface still so that it can borrow the blue of the sky, can reflect the rising buildings and the office workers on their lunch. Make the place easy to enter and cross. Invite the whole loud, living city here, on foot and by train. Remember why we dig graves so deep and cover them with earth. Most of all, make people look up. *I am, of course, precisely nobody.